Observation - fungi - UK and Ireland. Description: This mushroom was seen at Sandwood Bay in NW Scotland in August 09. Sorry I didn't put anything of scale in the photo but it is about the size of a large fist. 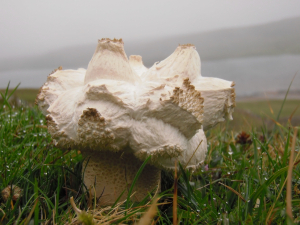 This mushroom was seen at Sandwood Bay in NW Scotland in August 09. Sorry I didn't put anything of scale in the photo but it is about the size of a large fist.